This comes from something that I did for Endurance Corner in 2006, Gordo Byrne's website. Gordo is a good foil & great friend. "Bobby is one of the finest coaches that I've had the pleasure of working with. If you get the chance to learn from him then take it! I have been using this for all of my runs since getting back to balanced training. It is working very well for me". 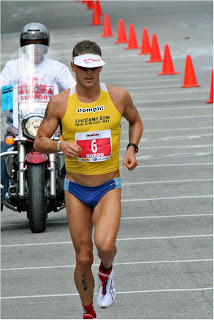 · The basic model I use is 10:00 of running & 1:00 of walking, but I easily adapt this to suit the athlete’s capabilities. 1. Phase 1: Beginner: This assumes no running at all prior to this. 1:00 run, 1:00 walk, build rapidly (weekly) to 5:00 run, 1:00 walk. 3. Phase III: This assumes advanced runner looking to increase both volume in long runs & speed in quality workouts. Have the basis be 10:00 run, 1:00 walk & build from there. I have had runners break runs into sections as large as 30:00, but sometimes find that on chunks larger than 15:00 some athletes have a hard time starting the run again. In the majority of athletes this is easily rectified by ensuring that the walk stride rate stays high (rather shorter steps & high cadence), that the walk is brisk with a purpose to covering ground, rather than thinking, “ah, rest”! Also ensure that the arms are kept in running mode—allowing the arms to drop down, slows the stride rate, increases the stride length, which in turn leads to “switching off” & the lengthened levers put the pelvis & hamstrings under increased stress. By following these guidelines the runner stays facilitated & easily restarts the next section with renewed vigor. 4. Threshold Workouts: I usually break these up into fixed times or distances any way. I design these around a total volume of 30 to 40:00. I find that longer walks here ensure a more rapid progression, i.e. velocity at the same heart rate increases fastest when longer rest periods are incorporated. Sample workout would be 3X1.5 mile at LT (heart rate or pace, depending on the phase of training) with a 5:00 walk between each. If the athlete does not have the speed, for example, to complete the quality sections in under 40:00, or is fast enough that the quality work is less than 30:00, then I would either break it up into time sections for the beginner, like 3X10:00, or lengthen the reps for the advanced, speedier runner, like 3X2.2 miles. 5. Tempo Workouts: Here the workout goal would be determined by considering specific event requirements. In the earlier part of this preparation phase I emphasize time sections at a specific heart rate, e.g. for half marathon run 4X15:00 at ½ marathon heart rate, with a 2:00 walk between each. Then in the latter part of the final preparation phase I’d have the same athlete run 3X5km at goal ½ marathon pace with a 2-3:00 walk break between each. I suggest a similar approach to marathon pace tempo runs & IM & ½ IM brick/combo runs. With the marathon I generally keep total volumes below & up to 15 miles (25km). 6. Long Runs: The purpose of long runs is to develop muscle endurance & train the body’s ability to metabolize lipids as a fuel source. A coach can objectively measure increases in vascularity in long runs by observing the athletes decoupling rates, (i.e. when pace slows, while HR remains constant). The basic idea is to be able to increase long run pace while maintaining predetermined sub AeT (aerobic threshold) heart rates. This is by far the most easy to improve through using the walk/run methodology. I find best results when I keep the ratio at 10:00 run, but move the 1:00 walk down as the athlete improves (by 5 to 10sec per jump) until a minimum walk period of 15sec. Gordo Note: "10:1 worked really well for me. I tried 11:15/0:45 and that really increased the demands of the session. For now, 35-40s seems to be "about right" for getting the reset that Bobby talks about". 7. Racing: For runners who run the marathon in slower than 2:30 (at least sub 3:00) & then, by virtue of IM world bests, all IM athletes, I strongly recommend racing the walk/run method during racing as well. Sub 2:30 marathons have been achieved by runners in this fashion. This implies that if you are going to race this way, train this way. However, for the runner who wishes to run considerably faster & is able to run sub 2:30, I would still use this approach on the majority of occasions, but there would have to be long runs & tempo runs that are continuous running. Gordo Note: "I noted #1 to #4 very quickly in my own training. The hardest part is the humility required to walk! What does the protocol look like for 1/2 IM? ***For an athlete like you... walk 15s every other aid station (drink on exit) -- walk 45s at the 10K mark // you need to train the walk -- remember how fast you saw me walk at Saguaro. If HOT then walk 15s every aid station as you'll need the fluids. Is this the correct protocol for IM, first 1/3 15min:15s, second 1/3, 15min:30s, third 1/3 15min:45s? ***Try it on your longest runs -- use the protocol that works best for your longest runs -- for me, I walk longer than 15s early in an IM as I want to settle from the bike and establish cadence. I love the run/walk technique! I love that it works for beginners to elite-level athletes. Good points & info in this post. A big thing for me/friends is not equating the walk time with "ah rest" as you said. I have to keep my cadence up & my arms in running mode vs. "shake it out" mode. I Really Love Simple Walk Race . It's Good Game For YourBodily and mental health. Well described in above article. its very informative and impressive.